1. Meeting Mr. Wrong (book mentioned above…guaranteed laughter and other healthy things included) by Stephanie Snowe. A true story of dating disasters and life gone awry told in an honest and hilarious and gosh-darn-awesome voice. The author is so authentic - I feel like I know her. If you don't see yourself getting the book anytime soon, check out her blog (just click on her name above). Same impish, feisty humor, in daily snippets. I want to be Ms. Snowe when I grow up. Well...at least when I'm older. How about tomorrow? 2. The Demon’s Lexicon by Sarah Rees Brennan. YA fantasy novel full of quotable sound bites and laugh-out-loud type moments, with an action-packed story and mystery to match. Also contains gorgeous bad boy with more ‘personality’ than Edward and Jacob *cough, cough* combined. 3. The INTERN’s blog. I’ve mentioned this before, but it’s worth checking again, and especially if you’ve never read the publishing INTERN’s snarky, fabulous adventures in manuscript and surreal-apartment-living land. 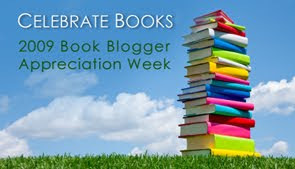 Today marks the start of Book Blogger Appreciation Week (which hereafter will be referred to as BBAW), a celebration for and by book bloggers. Though I don’t consider myself a full-fledged book blogger (mostly because I like to post about…oh…everything? ), I am taking part because the community is awesome, and I’ve met some super-sweet people through the blogging experience. There you have it. I nominated the INTERN for best publishing industry blog, and can only assume that she didn’t make the shortlist through miscarriage of justice (err…scratch that. perhaps simple procrastination? failure to enter? yeah…). She’s my ‘mention.’ Many others deserved to make the shortlist as well, and I voted for them (you’d better believe it! ), but this is the post entitled THREE things, so I’ll leave it at that for now. Go off and have a lovely Monday, and look around my blog tomorrow for a book blogging interview swap and GIVEAWAY. Yes, I said it. Now, shoo! See, and my husband was wondering the other day why I *always* have a book with me. It's because there are unforeseen circumstances, I said. Disastrous parties is now on that list of possibly unforeseen circumstances. Thanks for the laughs, and the new blog! I am sorry the party was a bust. I hate when that happens. At least you had your book. I know when we go to parties, my husband looks at me a little disappointing when I grab the book and tuck it in my purse. I am usually a very sociable person, but lately find myself gravitating toward the current book I am into. I am always trying to be prepared for the low times (have a book in hand when all else fails). My husband thinks I should at least try to enjoy myself with others when we are invited and not sit in a corner reading. Which, I guess I agree with him, but I hate being bored...especially when I have a perfectly good book to read. But anyway, it sounds as you had a very exciting book to read and had a few laughs anyway. Sounds like a great book. Oh, I am so happy that Meeting Mr. Wrong salvaged that party for you! I just about died laughing reading that book. I also love the INTERN. Another brazen chick who cracks me up! I have yet to read "The Demon's Lexicon." It's good to know, however, there is some humor it. I like my YA horror and fantasy mixed with a few laughs. At least a good book makes everything better :) And it sounds like a funny one. I can think of a few parties I've been too where I wished I'd brought along a good book, too. Meeting Mr. Wrong sounds so good. And I've had Devil's Lexicon in my netbook for a while now. I really must get to it - love what you said about the laugh out loud bits! Aww! Thanks! :) I'm so glad you liked the book. Well, I've been to parties like that, and all I can say is that I wish I had a book with me. I'll have to check those books out! no. no, seriously! you read a book at a party?! oh, you ROCK you do. THAT is too funny. What? what kind of party was it?!? thanks for the 3 laugh bits. wouldn't have thought demon's lexicon would be in the mix.